A delicious mix of ripe plump blueberries, coconut and lime, incorporated in an all-in-one sponge base, sprinkled with desiccated cocunut. Whilst the cake is still warm a tangy combination of lime juice and icing sugar is drizzled over the surface of the cake. If blueberries are not available use any soft berry fruits, such as raspberries or blackberries. Preheat the oven to 180C/gas 4. Lightly grease and line a 23cm square baking tin. In a small bowl mix together 50g of the coconut, blueberries and plain flour and set aside. 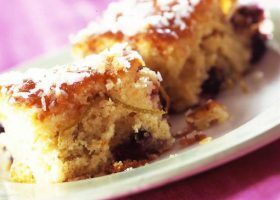 Prepare the sponge: Sift together the self-raising flour and baking powder into a mixing bowl with the caster sugar, butter and eggs. Whisk together using and electric or manual whisk until the sponge is well blended. Stir in the grated lime and fold in the coconut and blueberry mix. Spoon into the prepared tin and smooth over the surface of the sponge mixture. Bake for 30 - 35 minutes until risen, or when a skewer inserted in the centre of the sponge comes out clean. Remove the sponge from the oven and set aside to cool. Whilst the cake is still warm, mix together the lime juice, remaining coconut and caster sugar. Using a skewer prick the sponge all over and drizzle the sweetened lime juice over the surface of the cake. Cut the cake into 15 - 16 pieces and serve warm or cold.